At Cosmetic Surgery & Dermatology of Issaquah, Inc., we offer a variety of high-quality dermatologic treatments and skin care that help common skin ailments, that include acne and dry skin to fungus and enlarged veins. Most treatments are minimally invasive and designed to give you the desired result safely. 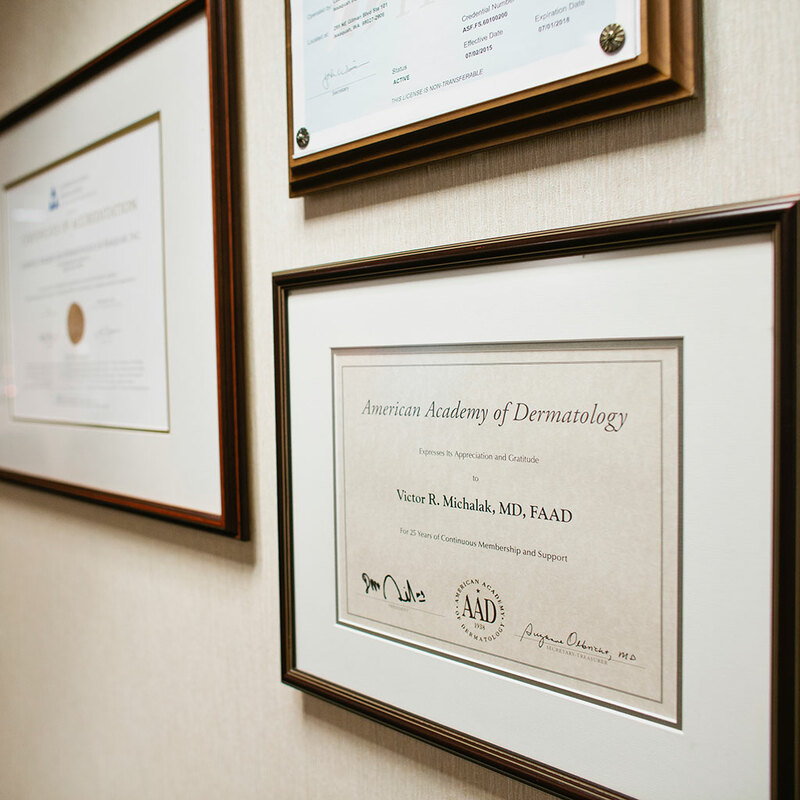 If you’re looking for an experienced and trusted dermatologist in Issaquah, Bellevue, Redmond, Sammamish, or surrounding Seattle area, don’t hesitate to schedule a consultation with a board certified dermatology specialist and cosmetic surgeon Dr. Victor R. Michalak or a member of our team of certified dermatologists. See what our patients have to say. When it comes to dermatology, not all skin types should be treated alike. Each individual patient must be carefully observed by a board certified surgeon in order to receive proper treatment and avoid unnecessary complications. When you see a dermatologist for any type of skin treatment, it is important that they consider your skin type, including its tone, texture, and complexion.At Cosmetic Surgery and Dermatology of Issaquah, we offer a premier experience with the latest in dermatologic technology. As the most common form of cancer, nearly five million Americans are treated for skin cancer each year. There is no such thing as getting a screening too soon, but looking out for the warning signs can help you to catch anything suspicious so that you can undergo speedy treatment. Early diagnosis of skin cancer can lead to easier and quicker treatment. Many Pacific Northwesterners in Seattle assume that with the cloudy climate, they don’t need to bother with sun protection. Unfortunately, this is not the case. Given this powerful threat, it shouldn't be surprising to learn that skin cancer is so common in Seattle and the greater state of Washington. The least common but most dangerous form of skin cancer is called Melanoma. Unless removed early in its development, this cancer can metastasize, spreading throughout the body. Therefore periodic complete skin examinations by a dermatologist and regular self-examinations of the skin are very important. Mohs surgery is an incredibly effective surgical technique for the removal of skin cancer. The method is most often used in the treatment of basal cell carcinomas and squamous cell carcinomas, the two most common types of skin cancer. It may be used when treating individuals that have recurring skin cancers, or cancers that are at a high risk for recurrence. Mohs surgery is an outpatient surgery that can typically be completed in three or fewer stages, usually requiring less than four hours. Moles are pigmented skin spots that can appear anywhere on the skin or mucous membranes. The presence of moles should not necessarily arouse worry, however it is a good idea to keep an eye on your moles to watch out for early signs of melanoma. It's recommended that you make note of changes in shape, texture, and color. Most moles do not cause pain and are generally inconspicuous. However, if you have a suspicious-looking mole, a dermatologist may recommend that a biopsy is taken. Acne is a very common skin condition that affects people of all ages. Acne occurs when pores and hair follicles become clogged with excess oil, dead skin cells or bacteria. If you have naturally oily skin, you may be predisposed to acne. For others, greater exposure to bacteria is the cause of their acne. It is treatable through a variety of proven procedures and medications. The best acne treatment plan is chosen based on factors such as the acne type, severity, skin type and area(s) affected, as determined by your dermatologist. Rosacea is a common skin disorder that appears as red, swollen bumps and visible blood vessels on the cheeks, nose, skin and forehead. No one knows what causes rosacea or how to cure it. Some professionals believe it may be caused by climatic exposure, chemicals or ingested agents. If rosacea is left untreated, bumps and pimples can develop. A new treatment type called the Vbeam laser treatment is one of the most effective treatments against rosacea today. If you are bothered by Stretch Marks, you're not alone. Stretch marks are caused by rapid stretching of the skin during periods of growth, such as during puberty, pregnancy, or significant weight gain. The normal expansion of the skin cannot keep pace with growth and a tear happens in the dermis. They appear to be slightly depressed lines on your skin. They often reside on the hips, abdomen, breasts and buttocks. Many stretch marks will fade away with time, but some are permanent and look like deep scars. Scars caused by acne, chicken pox, injuries, burns or surgery can be improved or removed entirely by the use of special laser and in some cases surgical techniques. Dr. Michalak is a specialist in these scar reducing treatments. Though the name sounds alarming, Spider Veins are merely veins that have dilated under the influence of increased pressure. Also known as telangiectasia, they are found closer to the skin surface than varicose veins and are smaller. Spider veins are tiny purple and red blood vessels found most commonly on the thighs or lower legs of women. They are hereditary and can form anywhere on the leg, from the top of the thigh to the ankle. Spider veins can be eliminated permanently through a simple office procedure called Sclerotherapy. The most common cause of a nail infection is fungus. Fungus appears more frequently on the toenails than on the fingernails. Nail Fungus Infection can be caused by an injury to the nail or surrounding area that allows the organisms a way to enter the skin. It can be an embarrassing, and sometimes painful condition to bear. Symptoms of nail fungus range from the crumbling and changing in color of the nail, to foul odor and separation of the nail from the nail bed. Luckily, treatment exists for this invasive, stubborn condition. Psoriasis is a chronic autoimmune disease that appears on the skin as spots, raised patches, scales, or lesions in a variety of shapes and sizes, and in different locations of the body. It is a condition that triggers the inflammation of T cells (type of white blood cell), which then causes the skin cells to grow faster than normal, and to pile up in raised patches. Though it can look threatening, it is not contagious. Anyone can develop psoriasis at any time. There are several factors known to increase your risk of developing the condition, such as family history, obesity, stress, and smoking. A hyperpigmentation of the skin, melasma affects mostly women, and is often caused by hormonal changes combined with UV (ultra violet) exposure. It develops as darker skin patches on the upper lip, cheeks or forehead. The exact cause and cure of melasma is unknown. However, there appears to be a direct correlation between the occurrence of melasma and female hormone activity. Though the onset of melasma may seem abrupt and shocking, there are fortunately a number of effective treatments to prevent hyperpigmentation, if not reverse it. Actinic Keratosis, also known as solar keratosis, is the most common type of pre-cancer condition. Actinic keratoses start small and are often felt before being seen. They feel rough or crusty and scaly, and often resemble warts. They range in size from about one-eighth to one-quarter of an inch or about the size of a pencil eraser, and appear on areas frequently exposed to the sun’s ultraviolet rays: the face, ears, the back of hands, and an unprotected scalp. If not properly treated, they can develop into squamous cell carcinoma, a potentially fatal form of skin cancer. Melanoma is one of the most common cancers and can develop on any skin surface, including areas of skin completely sheltered from the sun and under the nails. It is known to cause the greatest number of skin cancer–related deaths worldwide. Melanoma occurs when the skin’s pigment-producing cells called melanocytes become malignant. One of best ways to catch melanoma in its early stage is to watch for moles that look abnormal. Herpes symptoms outbreaks often referred to as cold sores or fever blisters, are caused by direct oral contact with the virus as it cannot survive long on inanimate objects, such as shared cups or straws. Some patients never exhibit symptoms, while some experience moderate to several cold sore outbreaks that are unsightly and may result in weeks of facial disfigurement. Oral antiviral medications are frequently prescribed to patients to both treat and prevent cold sore outbreaks. Eczema can indicate any one of a number of skin conditions that cause the skin to become swollen and itchy. Often when a person says they have eczema, they are referring to atopic dermatitis, a chronic condition that is the most common type of eczema which causes the skin to swell, crack, and ‘weep’ clear fluid. The symptoms of eczema are often managed with over-the-counter creams and moisturizers. In cases where symptoms become severe, steroid creams or oral steroids may be prescribed. People of all ages and skin types can be affected by dry skin. Dry, rough, itchy or flaky skin can be unsightly and also uncomfortable. In severe cases, dry skin results in scaling, cracking or even bleeding. Cold weather or dry climates may cause temporary dry skin symptoms, but for some people the problem can persist year-round, no matter what climate. There are many non-prescription moisturizers that work well for treating dry, rough skin in patients with all skin types. When dry skin is caused by a chronic skin condition however, such as psoriasis, a stronger treatment may be necessary.